Anaheim, CA- There are certain phrases in life that trigger animpulse response such as “How ’bout them Cowboys?“, “Let’s get ready to rumble!” , and as in the case of 66ers Director of Broadcasting, Sam Farber, will find out in a short period of time, “I do”. For baseball fans and players the sweet sound of “Opening Day” elicits thoughts of excitement, a fresh start, and the feeling that all teams are on an equal level hoping they can catch fire at the right time propelling them to the World Series. For a pitcher, receiving the ball on Opening Day is a sign of respect and trust that they are to be depended on during the grind of the season to be a staff ace or get out of a pressure cooker of a situation while the opposing team is threatening to score. This season and last, the Inland Empire 66ers have helped mend a couple of Angels players on their way back to contributing for the Major League club. This season, Jerome Williams was on the hill for the 66ersmaking his first start in the California League since 2008 as he rehabbed an ailing hamstring on his way to working back into the Angels starting rotation. He helped Inland Empire beat I-10 rival Rancho Cucamonga Quakes 6-5. In five innings of work Williams was able to strike out five Quakes allowing only two runs. Last season, 66ers fans saw Angels reliable lefty reliever Scott Downs during Opening Night. Any time a player that has made it to the Major Leagues rehabs with a minor league team, plenty of inquisitive minor leaguers pick the brains of the rehabbing players to get any tips or edge they can on advancing their own careers. Luckily for the current 66ers, it’s a position Williams embraces. Taking the mound for the Angels tonight, Williams lived out another dream of his. The Hawaii native received the nod to pitch on Jackie Robinson Day across the Major League and wear #42 in honor of a childhood idol. Williams will now have another story to reflect on and share with minor league players if another rehab start is needed in his career. Preferably not on Opening Day though. After losing their first nine games of the second half of the Cal League season, the Inland Empire 66ers have turned things around. They’ve won four out of the last five games and sit two games out of the Cal League South Wild Card spot. The High Desert Mavericks are in town for the weekend and it could end up being a very important series for both teams as both are in the hunt for that Wild Card spot. 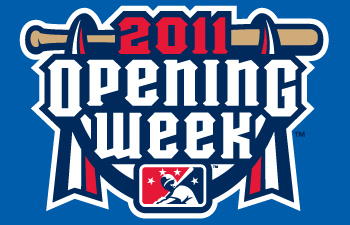 The home stand started out with an exciting 7-1 victory over the Visalia Rawhide on the 4th of July in front of 7,892. It was the biggest crowd the 66ers have seen all season long at Arrowhead Credit Union Park and seemingly every fan stayed afterwards for the impressive 15 min firework show. Inland Empire then took the next game as Kyle Hurst gave an outstanding pitching performance picking up his sixth win of the season in the 6-1 win. Although they dropped the final game of the series to the Rawhide and couldn’t complete the sweep, they still got the series win. It’s been in the mid to high 90s all week here in San Bernardino, CA, and the heat doesn’t look to be letting up anytime soon as forecasts predict similar weather patterns to be coming through during the weekend. Matt Long looks to add to his league leading triple count in this series and Michael Wing will try to extend his hitting streak to 12 games tonight. 66ers right fielder, Kole Calhoun, will try to continue to be the force in the middle of this lineup as he has been the most consistent hitter throughout the course of this 2011 Cal League campaign. With 56 games to play in the second half of this Cal League season, a lot is on the line and it all starts with this series with the High Desert Mavericks. Koren Wetmore of ROTWnews.com compiled a great piece about Opening Night at Arrowhead Credit Union Park. This short video includes a great interview with 66ers manager Tom Gamboa and pitcher Johnny Hellweg, along with clips from the game and comments from fans. Check it out below, then click over to the website and read the accompanying article. One of the best things about going to a baseball game is enjoying it with someone else. Being with a group of people enhances the experience and makes the time you spend with everyone that much more memorable. Bringing twenty or more people to a 66ers game at one time qualifies for the group rate, and gives preferred seating to the group to sit together. To let everyone else know what a great time the group is having, the 66ers will also recognize the party on the big screen. When it comes to bringing a group to Arrowhead Credit Union Park, the 66ers can accommodate an outing of any size. The Patios are the largest areas, and great places to add the all-you-can-eat option to satisfy everyone’s hunger. Another great place to watch the game with a group is either the first base or third base terrace. Shaded private seating balcony is available on the suite level as well as a spot for the all-you-can-eat-option. Terrace seating is also a prime location to catch customary foul balls down either line as well. Want to watch the game but avoid the summer heat? Air conditioned luxury and hospitality suites are just the place to catch the game. All private suites are furnished and equipped with DirecTV and include their own kitchenette, personal suite server, and access to the La Paz Bar on the suite level. What better way to entertain clients or show employee appreciation than a suite? Children can benefit from group rates as well. Birthday parties are always a favorite among kids, especially when Bernie comes to visit. Another way to create life long memories is for a son or daughter to take the field with the 66ers through the Baseball Buddies program. Children will receive a 66ers logo baseball and a food voucher for a hot dog, chips, soda, and ice cream. Booking any of these great options is as easy as one, two, three with the 66ers. All we need to know is the date and how many people to expect. Then step back, let us handle the planning and YOU take all the credit and praise for what a great time was had by all. Since it’s that easy, what are you waiting for to let the 66ers host your next party or group event? 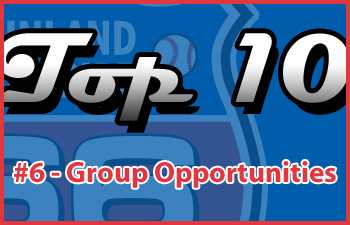 Give us a call at (909) 888-9922 or visit 66ers.com to learn more about all our group options. Last post we asked for your nominations for the Inland Empire all-time top 10 list, and you came through with eight players in, seven nominees out, and a final five trying to pick up the last pair of spots. I’ll leave you in suspense on who’s made it so far (probably not a lot of suspense for most of them), and ask you for one last vote to finish off our top 10 list. Only a few more weeks left of voting, and now we’re asking for fans to choose TWO of the following players for selection to our franchise’s all-time top-10 list! Remember, we’ll choose one lucky voter to receive a bobblehead or tickets to Opening Night just for voting. E-mail media@ie66ers.com with your selections. Dave Burba (1988)- Certainly a recognizable big league name, he was a big star for the then Spirit, filing away a top-10 season in team history for ERA as a 21-year-old. Burba went on to pitch for six major league teams in his 15-year career, during which he accumulated 115 career wins. Jeff Nelson (1988)- Nelson was one of the top clutch relief pitchers in baseball history, winning four World Series titles between 1996 and 2000 while a member of the New York Yankees. The 2001 AL All Star pitched in five World Series in total, and in 16 innings allowed just three earned runs (a 1.69 ERA in the Fall Classic). Hong-Chih Kuo (2000)- Kuo has made several cameos in the Inland Empire, and has never given up a run while pitching for the 66ers franchise. Last year was his best yet in the big leagues as Kuo was named an All-Star for the first time in his career thanks to his 1.20 ERA in 56 appearances. Shin-Soo Choo (2002)- Choo’s prodigious power has yielded back-to-back 20 or more home run seasons for the Indians, but while with the 66ers he was known more for his speed. Choo has the third most triples in 66ers history for triples and in 2003 recorded 13 three-baggers, the second most in a season in team history. Kenley Jansen (2010)- Kenley Jansen the catcher had his share of struggles in the minors, but Kenley Jansen the pitcher blew through the minors like one of his fastballs. Jansen needed just 11 appearances in the California League in 2010 to demonstrate he was ready for a tougher challenge, and when he didn’t find one in AA either he was sent all the way to the majors (one of the fastest ascents since Ken Griffey Jr.) In 25 appearances for the Dodgers in 2010 Jansen was 1-0 with four saves and a 0.67 ERA. To pick your selections, e-mail media@ie66ers.com. You may pick no more than two. The top 10 66ers in franchise history will have banners on the concourse. We are one month away from Opening Night, April 7th at Arrowhead Credit Union Park, and while we here at the 66ers are looking forward to the team’s 25 season of baseball, we are also looking back at the past 24 seasons and some of the great players who started their careers here. It’s not just us in the front office, we’d like you to look back with us as well and help us pick the top-10 players in franchise history. E-Mail media@ie66ers.com with your top-10 and be automatically entered to win either a pair of ticket vouchers for Opening Night or a bobblehead! Now some questions may quickly come to mind in terms of what we’re looking for. Do we want players who excelled while playing in the Inland Empire, or players who went on to great careers in the big leagues? The answer is yes. Beauty is in the eye of the beholder, and your choices for the ten best can be based on any criteria you choose. Ken Griffey Jr. (1988)- Not a lot of time spent in a Spirit uniform but he certainly had an impact. In just 58 games he slugged 11 home runs and hit .338. Once he hit the bigs he put up even more impressive numbers. All told the 1997 MVP was sent to the All-Star game 13 times, won 10 Gold Gloves, seven Silver Sluggers and is considered one of the best players of his generation. Rich DeLucia (1988)- Obviously you can make a serious case for the class of 1988 being the best in franchise history. DeLucia posted a top-10 ERA in team history before going on to a 10-year MLB career, including a 12 win 1991 season where he was in the top five for Rookie of the Year. Mike Hampton (91-92)- Mike Hampton dominated both the California League and the Major Leagues in his time. He is in the top 10 in 66ers history for career Wins, Innings Pitched and Starts, and in 1992 he led the Spirit Staff in Wins, ERA and Strikeouts. After graduation Hampton was selected twice for the MLB All-Star Game and in 1999 led the bigs in wins with 22. Keith Johnson (1995)- Johnson has the distinction of being the only player in franchise history to make his Major League debut with the Angels. Since retiring as a player, he’s gone on to become a successful minor league manager. This coming season, Johnson will lead the Salt Lake Bees (Angels-AAA). Paul Konerko (1995)- Paul Konerko is still clobbering baseballs in his mid-30’s. 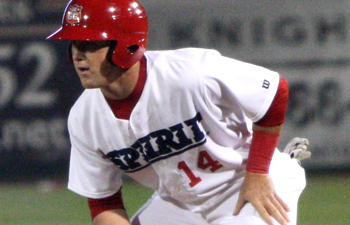 As a 19-year-old he showed signs of what was to come, smashing 19 home runs as a member of the Spirit, validating his standing at the time as one of the games top 50 prospects. He broke into the Majors in 1997 and has hit 365 home runs in 14 major league seasons. 2010 might have been his best. He hit 39 home Runs, drove in 111 RBI, and hit .313, while finishing fifth in the American League MVP ballot. Matt Herges (1995)- So the class of ’95 was loaded as well (makes sense since that was the first team to bring home a title). Herges has been called from the bullpen to pitch for eight different major league organizations over 11 seasons, and is still pitching at age 40. Adrian Beltre (1996)- Beltre was just 17 when he broke in to the lineup in San Bernardino and has become one of the top third-baseman of his time. He led the majors in Home Runs in 2004 with 48, and last year was selected to his second All-Star Team. Ted Lilly (1997)- The 1997 California League Pitcher of the Year is still in the 66ers single season Top 10 for strikeouts and ERA, and is also in the 66ers career top-10 for Earned Run Average as well. 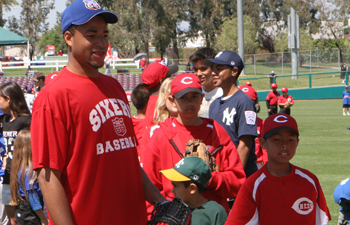 Lilly is a two time major league All-Star as well, and has hit double figures in wins each of his last eight seasons. Rafael Soriano (2001)- In 2010 Soriano led the Majors in Saves (45) and was named an All-Star for his efforts. Back in 2001 he was a 21-year-old pitcher for San Bernardino who went 6-3 with a 2.53 ERA as a starter before quickly being promoted up the line. Felix Hernandez (2004)- He’s a no-brainer for his work as an Inland Empire alumni (2010 Cy Young Award Winner), but Hernandez had already established himself as one of the franchise greats when he won California League Pitcher of the Year honors in 2004. King Felix struck out 114 batters in just 92 innings that season, on his way to a 9-3 record. Adam Jones (2005)- The former Mariner’s first rounder blew through the Inland Empire in 2005 when the then 19-year-old hit .295 and established himself as one of the game’s best prospects. The following year Jones made his MLB debut. In 2009, one year after being traded to the Orioles in 2008 in the Erik Bedard deal, Jones may have had the M’s regretting the deal as he was sent to the All-Star game and won a Gold Glove. Just 25-years-old, the best may be yet to come for Jones. Brandon Morrow (2006)- Morrow made a very brief pit stop in the Inland Empire after being drafted fifth overall by Seattle in 2006 (five spots ahead of Tim Lincecum). Morrow was mostly a reliever in the bigs until last year when he broke through in his first season north of the border pitching for the Blue Jays. In 2010 he recorded his first 10 win season and he threw a one hit, complete game shutout versus the Tampa Bay Rays. Carlos Santana (2008)- The 2008 California League MVP ranks in the 66ers career top 10 in Batting Average, and the single season 10 best for Batting Average and RBI. Two seasons after being the top catcher (or any other position) in the California League, he was a backstop in the bigs, making his MLB debut for the Indians. Travis Denker (2007, 2010)- The leader of Denker’s disciples, Travis is in the 66ers career top 10 or Hits and doubles and the single season top 10 for batting average. In his eight minor league seasons he has amassed over 400 RBI, and nearly 800 hits as well as almost 80 Home Runs to go with legions of fans. Scott Van Slyke (2008, 2010)- Van Slyke may be the most successful in hitter in 66ers franchise history. He is the Inland Empire record holder for RBI and Doubles, top five for Home Runs and Runs, and top 10 for career hits, games, at bats and walks. His 2009 campaign was one of the best single seasons in team history (.293, 23 HR, 100 RBI). To pick your top-10 E-mail media@ie66ers.com. You must pick at least five players but no more than 10. The top 10 66ers in franchise history will have banners on the concourse.